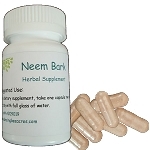 Hand-selected neem leaf is extracted in alcohol, distilled water and vegetable glycerin. Recommended use is five to 20 drops per day internally. May also be used externally for acne and other skin disorders. 2 oz. INGREDIENTS: Distilled water, neem, alcohol, glycerin.